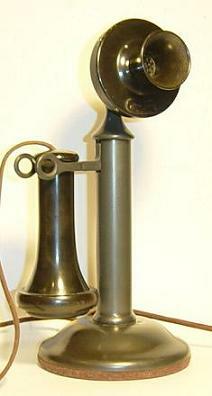 DESK STANDS, often called “candlestick” telephones, were the first desk telephones manufactured by Western Electric. The desk stands that were built before the turn of the 20th Century were extremely ornate and are now worth many thousands of dollars. The desk stands pictured on this website were manufactured from approximately 1904 until 1941, and were refurbished for re-issue by Western Electric and the local Bell System companies for many years thereafter. The desk stand is not a complete telephone by itself. It requires a separate subscriber set, sometimes called the “bell box” or “subset.” Together, the desk stand and the subscriber set comprise the complete telephone. The bell box contains the ringer, of course, as well as the induction coil and condenser(s) for the talking and ringing circuits. The bell box was usually mounted on the wall at the baseboard, or sometimes inside the kneehole of a desk or under a table. 20 SERIES - In 1904 Western Electric introduced the Model 20B, a straight shaft desk stand with an un-insulated 229 transmitter and 122 outside terminal receiver, made of nickel-plated brass. A few of the other desk stands in this series were the 20S, 20BC, 20SC, 20PC, and 20AL. Western Electric desk stands were never marketed in polished brass because brass tarnishes so easily. The earliest brass desk stands were nickel-plated. Later versions were black. 20AL desk stands, finished in black, were manufactured new from about 1912 until the late teens. They were equipped with an insulated 329, 323, or 337 transmitter and a closed terminal 143 or 144 receiver. Like virtually all other Bell System telephones, 20AL desk stands continued to be refurbished for reuse long after production of new sets ended. 40 SERIES - Series 40 desk stands are identical to series 20 desk stands, except that the bases and stems are steel. The steel bases and stems of brand new 40 series desk stands were anodized in a dark grey Bower-Barff finish (honest, that's the name). Brass receiver hooks, perches, transmitter cups and transmitter faceplates were painted in a matching dark grey finish. Factory refurbished series 40 desk stands were frequently repainted in black enamel. 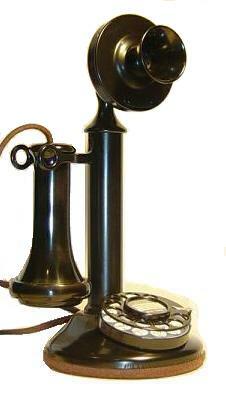 Western Electric’s dial desk stand is THE classic old-fashioned telephone! When the BELL SYSTEM inaugurated dial service in 1919, Western Electric redesigned their desk stands to accommodate a dial. 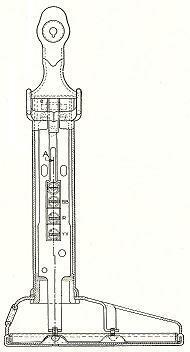 The stem was moved back toward the rear of the base so that a dial could be mounted directly in front. 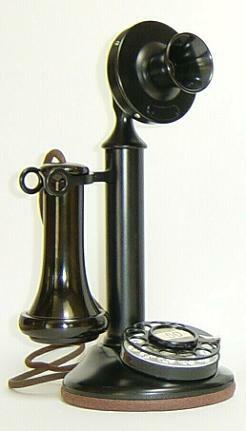 Western’s first dial desk stand telephone was the 50AL, followed later by the 51AL and 151AL models. All three models were identical in appearance, the only differences being internal. 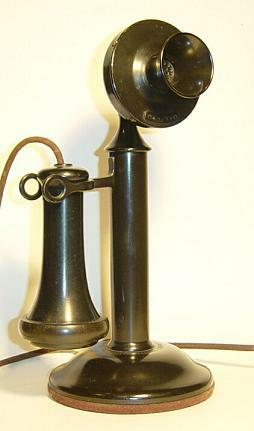 50 SERIES - The 50AL was Western Electric’s first dial desk telephone. Ironically, when the first Bell System dial exchange was opened in Norfolk, Virginia in 1919, the first dials used on Western’s new desk stands were made by Automatic Electric, a competitor that manufactured telephones for many non-Bell System independent telephones companies. Eventually, Western Electric began producing their own dials. The earliest versions of the 50AL had patent dates stamped on either side of the lower edge of the base, the most recent date being “MAY 7 18.” Patent dates on later bases were centered in front, with “SEPT 21 20” being the most recent date. 51 SERIES - In the mid-1920s, Western Electric engineers redesigned the switchplate inside the stem of the 50AL desk stand, changed the wiring harness from four conductors to three, and added a small terminal block inside the base. The redesigned set was coded “51AL.” The modifications allowed the receiver and mounting cords to be terminated right inside the base instead on the switchplate, which had to be pulled from the stem on the 50AL. This made servicing the 51AL a lot faster and easier. Externally and electronically, the 50AL and 51AL are identical. 151 SERIES - By the early-1930s, Western Electric began using “anti-sidetone” circuitry to reduce the sound transmitted between the transmitter and receiver of the same telephone. Western added another set of contacts to the switchplate, a five-conductor wiring harness, one more terminal block in the base, and a mounting cord with four conductors instead of three. The re-wired desk stand was coded “151AL.” Since all 151 series desk stands were refurbished from older 50 and 51 series desk stands, the perch stampings are always stamped over of earlier markings. 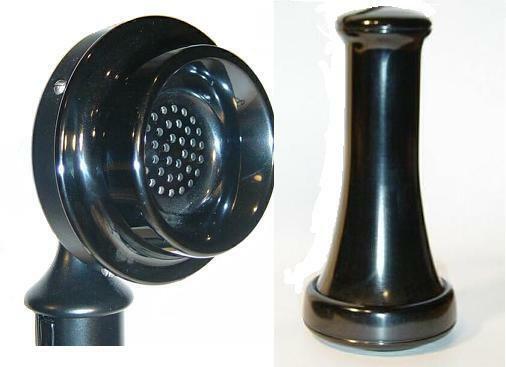 With the introduction of the F1 handset in the mid-1930s, Western Electric developed the F1 transmitter and HA1 receiver capsules. To accommodate these new components on desk stands and “2-piece” wall sets, Western Electric engineers designed the 635A transmitter housing, dubbed the “Bulldog” because of its snub-nosed appearance, and the 706 receiver assembly, which it is shaped like the original 143 and 144 receiver assemblies. Throughout the 1940’s, and later, older desk stands being rebuilt were often retrofitted with these newer parts.